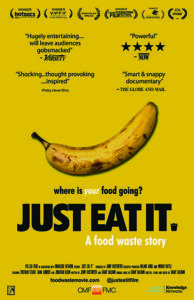 Sustainable North Grenville is hosting a screening of the award-winning film Just Eat It – A Food Waste Story on Tuesday, March 21. The film will be shown at the Grenville Mutual Community Room, 380 Colonnade Dr., in Kemptville, starting at 7:00pm. We all love food. As a society, we devour countless cooking shows, culinary magazines and foodie blogs. So how could we possibly be throwing nearly 50% of our food in the trash? In this documentary, filmmakers and food lovers Jen Rustemeyer and Grant Baldwin dive into the issue of food waste from farm, through retail, all the way to the back of their own fridge. After catching a glimpse of the billions of dollars of good food that is tossed each year in North America, they pledge to quit grocery shopping cold turkey and survive only on foods that have been discarded. In a nation where one in ten people is food insecure, the images they capture of squandered groceries are both shocking and strangely compelling. Featuring interviews with author, activist and TED lecturer Tristram Stuart, food waste expert Dana Gunders, and acclaimed author Jonathan Bloom, Just Eat It looks at our systemic obsession with expiry dates, perfect produce and portion sizes, and reveals the core of this seemingly insignificant issue that is having devastating consequences around the globe. mination of our throw-away society. In Just Eat It, they turn their eye to food waste from farm to fridge. Just Eat It brings farmers, retailers, inspiring organizations, and consumers to the table in a cinematic story that is equal parts education and delicious entertainment. “Lively, funny and thought provoking.” Globe & Mail. Sustainable North Grenville is a group of citizens interested in helping to make North Grenville a more sustainable community. Its mission is to foster a resilient community that meets the social, cultural and economic needs of its residents now and for the future, while preserving the environment’s ability to support it. Admission: Free. This event is open to the public. Light refreshments available. This entry was posted on Tuesday, March 14th, 2017 at 4:52 pm. Celebrate Earth Day at the 11th Annual North Grenville Sustainability Fair & Market! Drift card study to determine risk to Rideau River from Energy East pipeline, launches on World Environment Day, June 5th. Can you help? As part of an ongoing stewardship program, Scouts have planted over 11,000 trees in North Grenville since 2002.